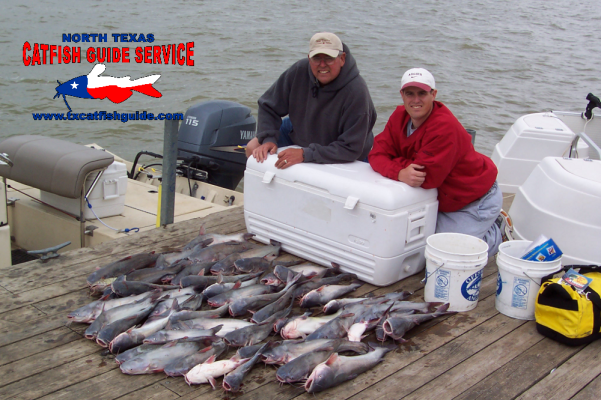 We’re Texas largest, longest running and most versatile fishing guide service for catfish. We’re North Texas Catfish Guide Service. If you’re looking for the adventure of a lifetime, keep reading! We’re a fully licensed and insured professional fishing guide service located in the Dallas Fort Worth area and have been in operation for over 13 years. 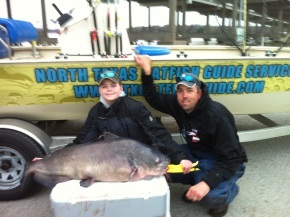 as the premier fishing guide service for catfish in North Texas! All You Have To Do Is Reel In Catfish! 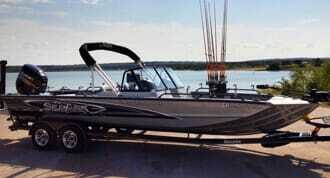 When you fish with us you fish from our boat, you use our bait, tackle, rods, reels and everything else. All you have to do is catch fish, we take care of the rest! We offer guided fishing trips for blue catfish, channel catfish, flathead catfish and BIG TROPHY CATFISH, and we catch them all on rod and reel and we do it in broad daylight! If you want to catch catfish, then we’ve got you covered! 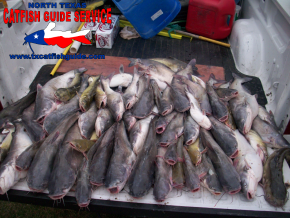 North Texas Catfish Guide Service offers guided catfishing trips the following lakes that are all within a short drive from the Dallas Fort Worth metroplex. You can get more details and learn more on our Where We Fish page. 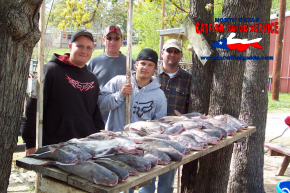 Whether your goal is catching a nice mess of fish to take home and have a big fish fry or whether you want to go and catch the trophy catfish of a lifetime, North Texas Catfish Guide Service has a trip to suit your needs and make sure you have a great day on the water with family or friends. How Does Guided Catfishing Work? Have you never booked a guided fishing trip before and interested in fishing with North Texas Catfish Guide Service but not sure where to start? The basics behind this are you call me and arrange an available date. You make a small despoist to reserve the date. We meet you at the lake the day of your trip at the specified time and go out anc catch catfish. You use our gear, our bait, our tackle rods and reels and fish from our boat. We do everything for you including baiting the hooks, casting them out, taking the fish off and even cleaning and filleting your catch at the end of the day. All you do is show up and fish and all you need to bring is whatever you want to eat or drink for the day and a Texas fishing license. Want to learn more or have questions? Check out our booking information pages or simply email us or call us at 817-522-3804. We are happy to answer any questions you might have. Texas Catfishing Is Good All Year Long! Fall, Winter, Spring or Summer the seasons don’t matter. 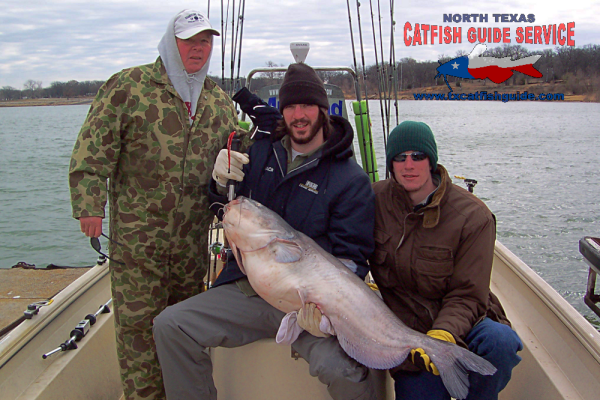 Fishing for catfish with North Texas Catfish Guide Service is good all year long regardless of seasons. 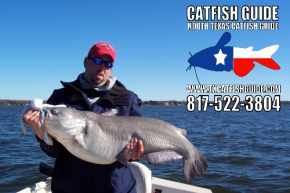 From catching numbers of blue catfish in the Fall, to big trophy class catfish in the winter, to huge numbers and fast and furious Spring blue catfish action and everything in between North Texas Catfish Guide Service can get you on fish regardless of the season. To get some more information on fishing at different times of the year and what to expect check out catfishing by season or feel free to give us a call. Rod and reel catfish guide trips for blue catfish are available all year long. The blue catfish is the species of choice for many of our clients. These fish hit hard, they fight hard and they are available in big numbers on the lakes we offer our guided catfishing trips on. We catch tons of catfish between one and ten pounds and trophy catfish are common all year long outside of the peak season for trophy cats. On rod and reel fishing trips for catfish we follow the current pattern for blue catfish using rod and reel baited with fresh caught shad, cut bait or even prepared bait at times Most of these cats will average between two and ten pounds with some bigger ones mixed in! The bite is good all year round but the peak season for catching huge numbers of blues is in the spring from March through May. Our spring shallow water trips produce fast and furious action that will blow you away! This is not your granddaddies catfishing. If you have an image of us lazily hanging a cane pole over the side of the boat at night next to a glowing lantern waiting for a bite to happen you couldn’t be more wrong. We use our Humminbird 1198 electronics and seasonal patterns of blues to pattern and locate them throughout the year and you will be surprised at exactly how and where we go about catching blues throughout the year. Trophy catfish on rod and reel are caught on our catfish guide trips all year long but the best time of the year to target trophy class blue catfish on rod and reel are from October through March with the absolute best times being from mid November until mid March. 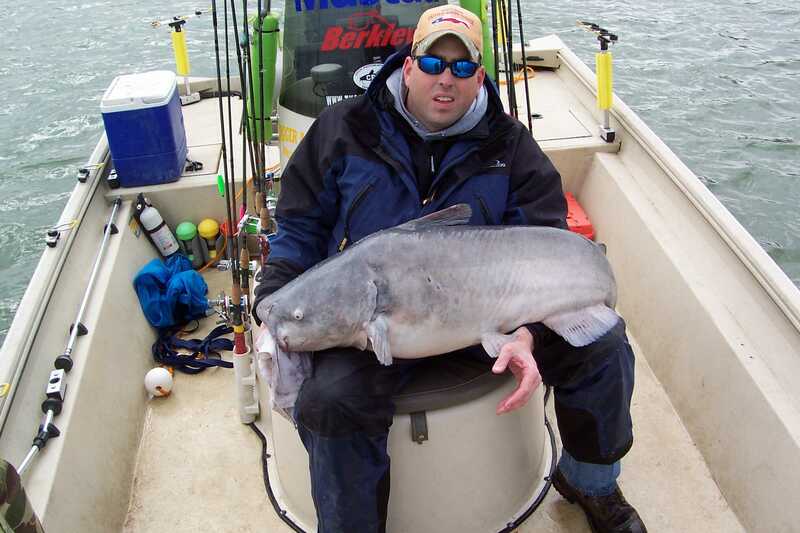 Again, we catch trophy class blue cats on our trips all year long but the cooler months are the time when they are much easier to pattern and we catch the biggest numbers of trophy class blue catfish on our catfish guide trips. The lakes we fish are full of trophy blue catfish in big numbers and these fish are known to grow well over 100 pounds. Blue catfish in the 20-50 lb range are very common and fish over 40 pounds are caught on a frequent basis through the cooler months. If you want to catch some numbers of “keeper” fish while targeting trophy class catfish we can do that too! produce the best but can certainly offer these trips on some of the other area lakes. Most catfish guide trips where we target trophy catfish exclusively average between five and seven catfish between twenty and forty pounds, but this is just an average. Some days will produce more and some days will produce less. 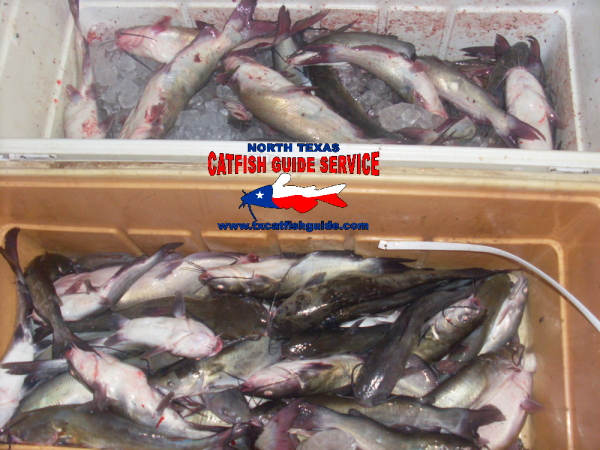 All catfish over 10 lbs are released after photographs. We will take plenty of photos of you and your fish on our catfish guide trips and will happily take proper measurements and documentation for a replica mount if you want but we put all of these big fish back to assure good fishing for future generations. This has been our policy for over 10 years now and we are happy to do our part to promote conservation of trophy catfishing. Give us a shout if you want to learn more or ask question or feel free to check out more trophy blue catfish information here. For fast action and big numbers of channel catfish are a great option to target on guided catfishing trips with North Texas Catfish Guide Service. Channel catfish are plentiful in all of the lakes we offer our catfish guide trips on. Channel catfish on Texas lakes typically average between one and five pounds and channel catfish typically produce very fast action. We use ultra light tackle and a highly effective catfish rig we have developed called the Secret Channel Catfish Rig for fast and furious catfishing action for channel catfish on area lakes. These fish fight hard and are fairly easy to catch sok the results are typically quite good on our guided catfishing trips. if you want fast action and lots of fish then a guided channel catfishing trip may be a good fit for you. During peak times it is not uncommon to catch as many as 100 channel catfish in a morning of fishing. 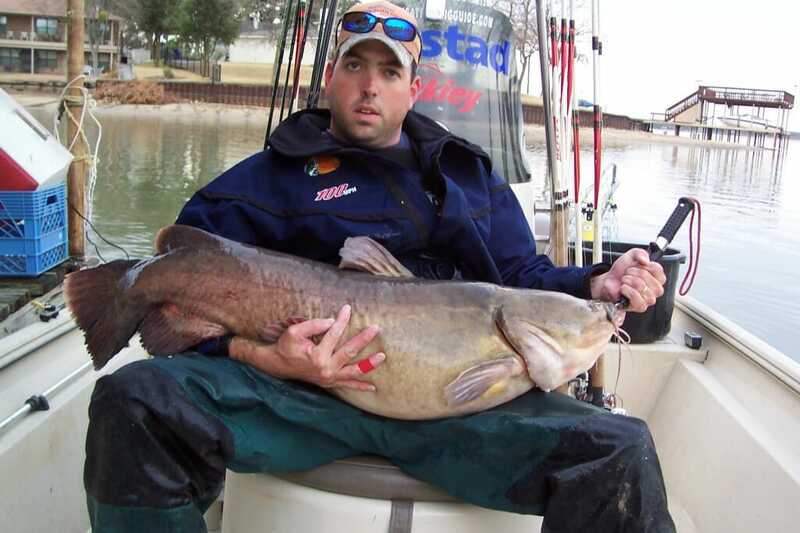 If big catfish are your thing most people prefer fishing for trophy blue catfish because the action is much faster but we also offer guided catfishing trips for flathead catfish on north texas area lakes. Flathead catfish get big, they bite hard and they fight even harder, but the best action typically comes in the evening, at night or early in the morning. Fishing for flathead catfish is slow fishing and requires patience and determination and waiting for that big flathead to strike. When the right time comes the payoff is huge but this type of fishing is not for everyone. Fishing for flathead catfish with us is best during the warmer months typically from March to October.